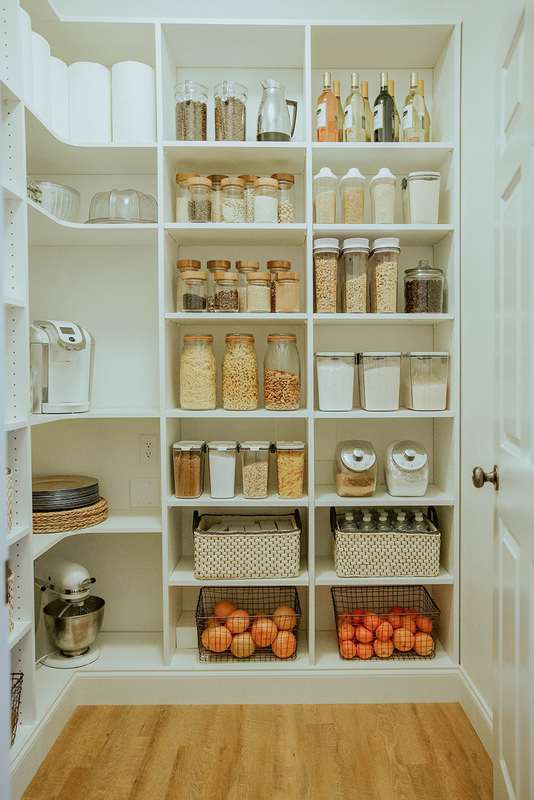 In case you missed the first pantry plan post, here is a quick re-cap! When we first moved into this home we knew we would have to figure out alternative pantry space. Our tiny pantry for a family wasn’t quite doing the job for our big family. We set up some temporary storage in the garage, but we realized our laundry room right off the kitchen would actually be the perfect walk in pantry size. 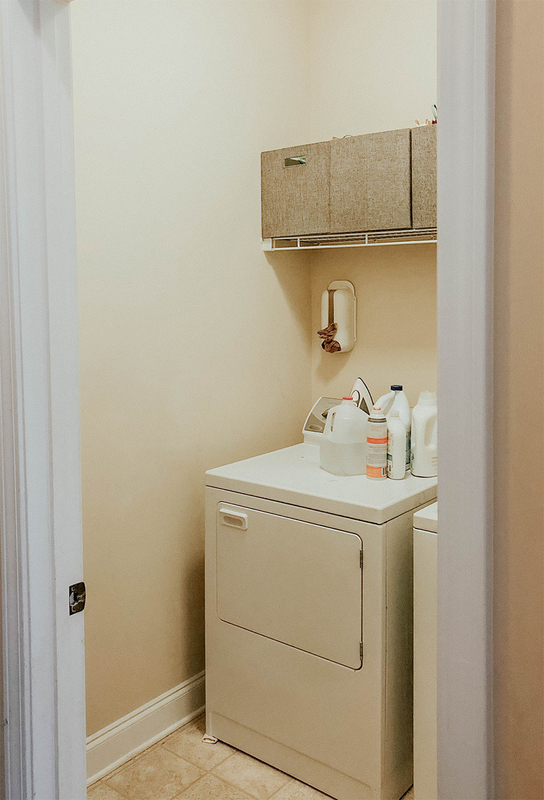 Here are all of the before and after photos of our laundry room to pantry room conversion, as well as a little more about the process! Don’t worry, we still have a laundry room! We finished a space in the basement for that. 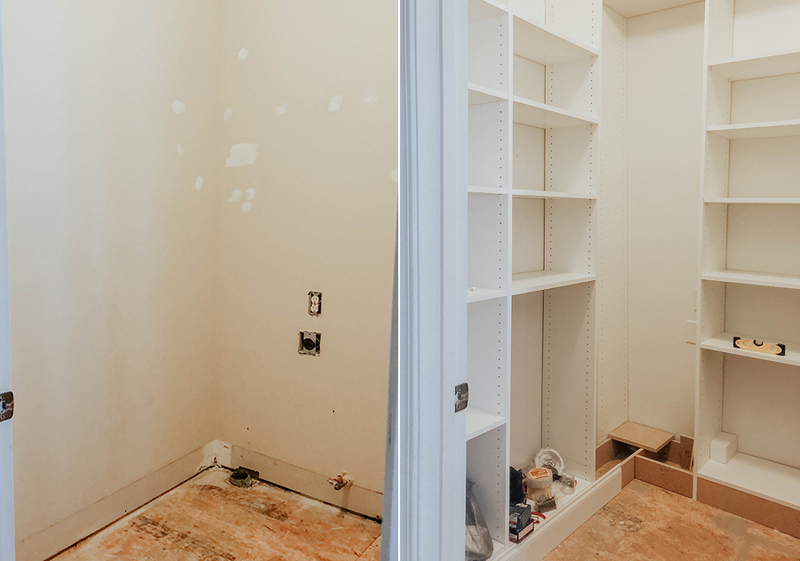 The first step to prepping this space was to haul out the washer and dryer and cover up all the outlets that we didn’t need. Gabe patched the walls where needed, and painted the room Moderne White by Behr since we already had that on hand! We researched options for shelving, and found the materials we needed to do our own built-ins. If you plan on doing built-ins yourself, we highly recommend adjustable shelves so that you can create the height between shelves you need. This did require a good deal of extra time since Gabe drilled through all of the pre-drilled holes to make sure we could insert shelving tabs on both sides. (They only come half way drilled through.) It was worth the extra time however, since we have so much more flexibility with the structure now. – We decided to use ¾ in thick and 11¾ in. deep melamine boards to construct the pantry. The vertical lengths are 8 ft. pre-drilled boards, while the shelves and top are undrilled boards cut to length. – All shelves except for the corner shelves are 20 in. in length. The corner is constructed from 30 in. corner shelves trimmed to size. – The unit is secured together using 1¼in coarse pocket screws, 1½ coarse screws, 2 in. coarse screws, and a few corner brackets. – Once the unit was fully built, we finished the floor with heritage plank flooring, which was left over from the basement, and added 5¼in baseboards. This project took about a month’s worth of weekdays from start to finish! The total cost of the re-build was a little over $500, not including the flooring costs, and I know I will be forever grateful to Gabe for giving us more space to stock up on copious amounts of the G.H Creters popcorn from Costco. But truthfully, so grateful to have a little more flexibility to buy items in bulk and see everything in one place. I have a feeling it will lead to less waste and more motivation to cook! Let us know if you have any questions at all, and we would be happy to answer. Thank you to The Container Store for teaming up with us for this post! Choosing the right sofa for your space. Adding bold colors to your home. Have a feeling it won’t last long around here;) thank you Charmaine! The real question is how do you lug laundry for 7 people up from the basement!? That is a true miracle! If it were me the basement would become the “dressing room” lol! Pantry looks beautiful! Thank you Andrea! You know what it’s like with boys…the organization won’t last long. ha! 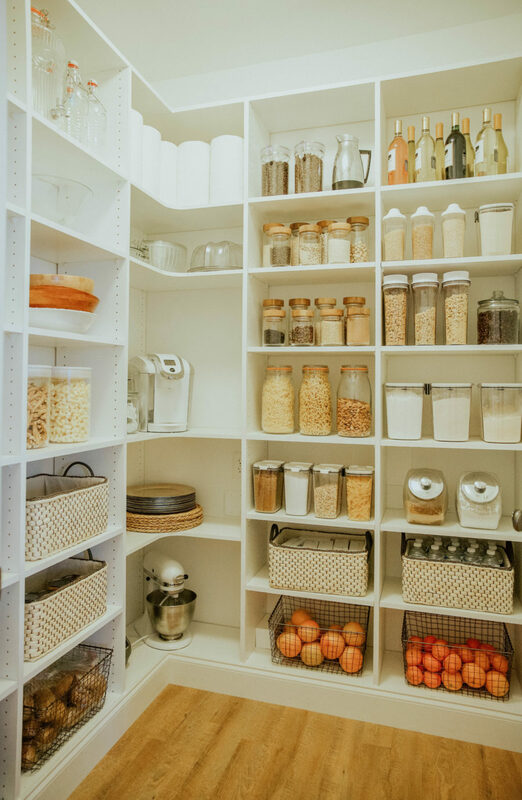 Your pantry is beautiful! I totally would have made the same switch! I can’t wait to see what your new laundry room looks like! It looks so amazing! And I’ve been dying to see how it turns out since we’re in the process of figuring out how to best design shelves for our laundry room turned pantry! I may not be able to be there in person, as I assume you are not in our area, but I would love to help in any way I can from a distance. We are only an email away if you or your husband have any questions or need direction. Insert drool emoji!! Looks amazing!!! This is so well done! 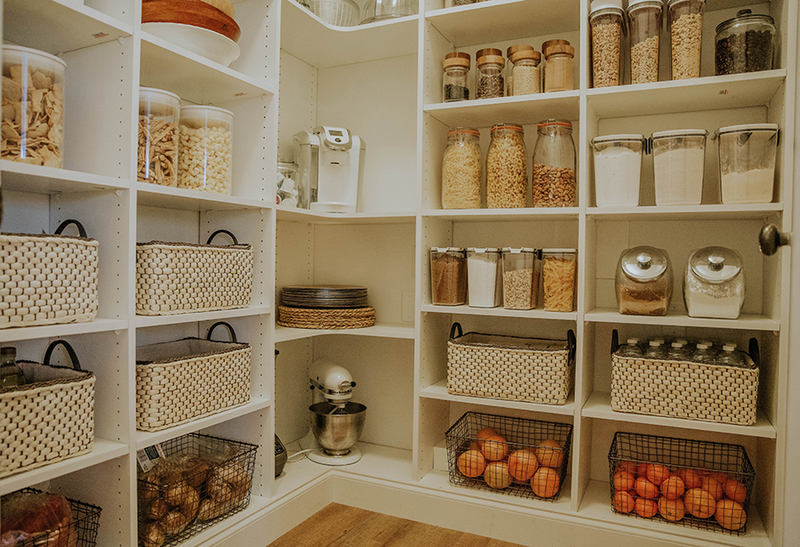 We’re doing a blog post in a few weeks on kitchen & pantry organization and would love to feature your pantry in it if that’s alright. It is total organization goals! Thank you Laura! It has been such a welcome relief of needed space! 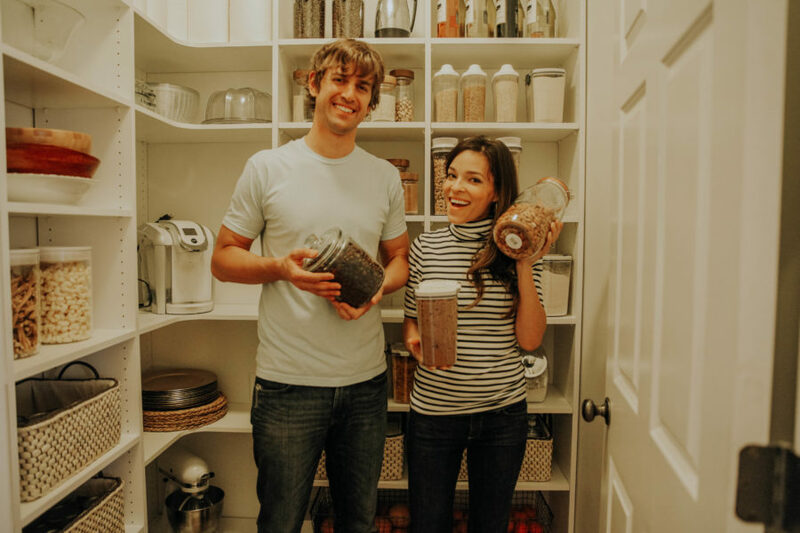 What are the dimensions of the pantry? Hi Jacqueline, the room is about 5ft 6in square. The shelving unit’s hight is 8ft and depth is 11 3/4in. 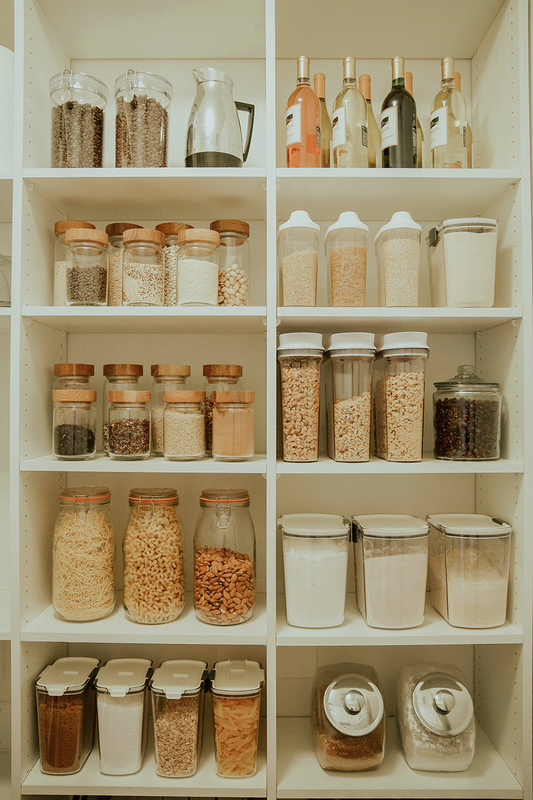 Where on earth do you keep overstock bulk food? Hi Katie, thank you very much. We have an old clunker fridge in the garage for bulk cold items. Diapers and paper products that we get in bulk are on shelves next to the garage fridge. 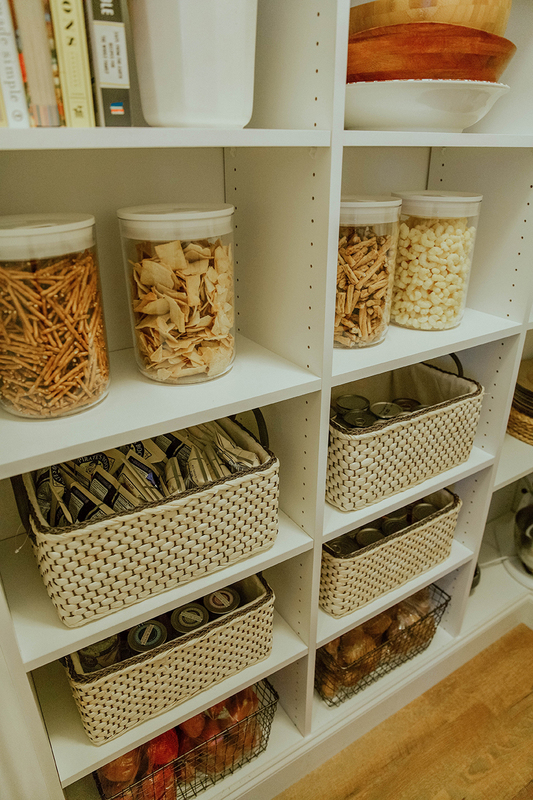 Bulk snacks are in the new pantry, but to be honest our kids are snack addicts, and we go through snacks faster than we can stock it. But that seems to be the case with most of the food in general. Terrific work done with love and attention to every detail. Kudos! Quick question however, what is the colour used on you laundry room cupboards? Where/how did you relocate your laundry appliances? Thankfully we were able to get a contractor to run some water lines to a room in our basement. The old water lines in this room were just closed off and we put an access panel in front of them that is now behind the shelving of the pantry. It looks beautiful! Where did you get the predrilled melamine boards? Thank you! Hi Susan – We got them from Lowe’s! How did you secure the vertical boards together/to the wall? Did you just attach them to the base or did you secure them at the top or to the wall as well?